Digital competence management is new for most organisations, representing a whole new approach to L&D. Competence is not at all the same thing as learning, and it is necessary to change not just the way you work with performance development - but the way you think about it. Working in the landscape of competence management is both exciting and exhausting. It requires a finely tuned compass, an updated map and a solid dose of tenacity. There are several areas one should be aware of during the implementation phase of a competence solution. Defining detailed and relevant competence requirements will take time and effort. A key success factor for our custmers has been defining competence requirements that are relevant in day-to-day work, which means that competence requirements must be defined locally. In order to ensure that requirements are kept up to date, ownership of the content in specific requirements and plans are often placed within the differing disciplines in the organization. Just consider this: the instruments and equipment used in one department will typically differ from those used in another, and the emergency procedures that are relevant to one team may be irrelevant for another, and so on. For this reason, defining requirements locally is a key factor in the implementation of competence management. Dare to let go of centralized control and enable local ownership in defining what the important and relevant competencies are. Enabling managers to define and manage competence requirements locally is what makes our technology truly useful. But it also means that manager competence must be developed and managers effectively engaged in the process of defining competence requirements for their respective disciplines and teams - and to keep competence requirements current and up to date over time. Competence management is a skill, and one that is usually not codified/formalized. Unfortunately, time invested in line manager competence development is often underestimated. Defining competence requirements is not hard as such - but there is a methodology to it. Illustration 1. Dossier enterprise competence compliance overview. Onwards and upwards - but how? While some will grasp the concept of competence management immediately, others might not “see the light” right away, and will therefore need more attention and support. Identifying and leveraging project champions is therefore highly important – and visible success-stories early in the process will contribute to project traction, motivation and good will from the rest of the organization. 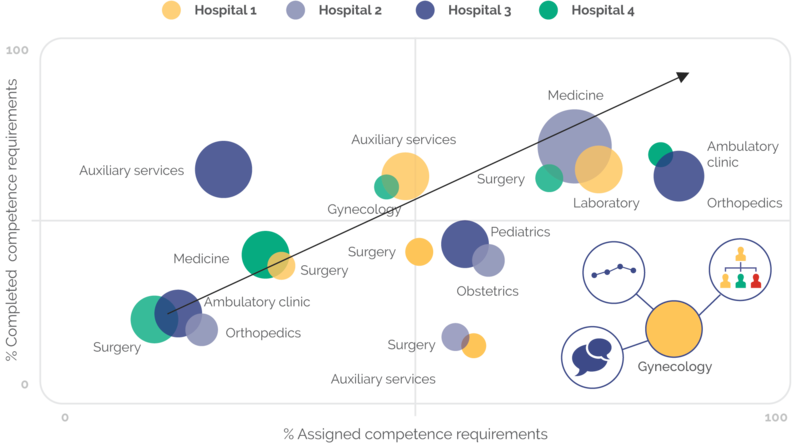 Champion traits vary – their motivation can typically be needs-driven (reducing a large administrative burden), quality-driven (ensuring i.e patient safety or compliance) or more interest-driven – (a passion for digitalization). When implementing Dossier, we often see a tendency to only consider formalized learning as learning/training that can fulfill a competency requirement. However, we know that 90% of all learning in the work-force happens on the job through i.e. social learning, monitoring, supervision and practice. Creating competency requirements and learning activities that match the reality is important, and enabling managers to think along the 70-20-10 scale of learning will help them design requirements and fulfillment-activities that match everyday work. That will boost the competencies of your organization in a cost-effective manner, as it reduces the overhead-costs of booking a classroom and lecturer. Furthermore, taking employees out of their daily work to attend classes etc. is inefficient across several dimensions: it keeps them from doing productive work, it reduces actual transfer of knowledge from class-room to everyday work-situations, and not least – line managers may fint it hard to create a course, while simply defining a competence requirement can be a lot easier. Using the office coffee machine as an example, the competence development and assessment process can be as simple as “have a supervisor show you how to use it and make them an espresso”. That is surely a lot easier and more effective than making an e-learning course to support the same process. From our experience, embracing the 70 and the 20 of the 70-20-10 represent significant untapped potential. It is not always intuitive as to which level of complexity each competence requirements should be designed at. How do you balance between including enough detail to make it operationally relevant, while at the same time keeping it at a level that makes sense for reporting? Managers need to be trained in what type of competence is important to document and manage, and to what degree competence requirements should be narrow and specific or broad and general. There is a wide specter of possibilities, and with no clear-cut recipe, one needs a case-by-case assessment of the level of detail necessary. If at all possible – keep it simple. At least initially our recommendation is to focus on the “need to haves” not the “nice to haves”. In some of the most highly educated/highly skilled departments/organizations, we sometimes encounter what might be labeled as “skills arrogance”. The good news is that these groups of employees take the quality of their competencies and the level of their skills very seriously, meaning you can almost be guaranteed that their competency profile is compliant. However, the challenge presents itself when you implement a system where these same employees are asked to document (“prove”) their skills and competencies in a manner that is perceived as “beneath them”. Having to prove and document competence to “admin people” can be experienced as humbling, unnecessary and demotivating particularly for highly skilled, trusted workers. To successfully get this group “on board” it is therefore extremely important to identify and communicate the “what´s in it for you”, and possibly to involve them in the standards definition process. It is important to communicate the purpose and benefit of robust competence management to everyone involved. Competence assurance is not simply an administrative function - at least when using Dossier. It enables every team to ensure capability at the point of work, to raise the bar if needed, to manage change and to make investments in training and development that is relevant and cost effective. While it can be experienced as a burden to have to prove one’s competence, it is a small overall price to pay for the knowledge that you, and your team, are the best in the world at what you do. Once this is understood, few fail to be inspired. The process of selecting and defining competence requirements often mark the end of a long journey. The competence requirements embody the chosen procedures, standards, resources and not least training methods that are relevant and important for successful operations. A lot of the time, these choices are not obvious. As such, the process of defining competence requirements embodies the entire process of establishing standards. While it is indeed a worthwhile endeavour, it is sometimes not a small endeavour. It is important, when considering this, that due respect is paid to both the value delivered by, and the resources required by, due process.